Hope coaches and players are eagerly anticipating their home season debut on Saturday, Sept. 1, when they’ll play on the newly installed artificial turf of Holland Municipal Stadium. 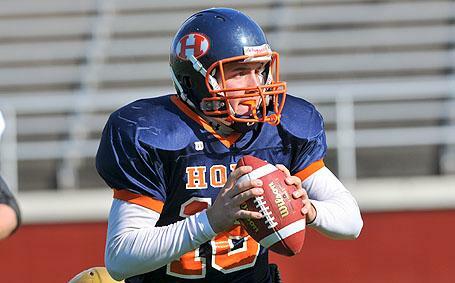 Hope College is in the process of acquiring the stadium from the City of Holland. The home field for Hope football games since 1979, installation of the turf is the first of what is expected to be on-going upgrades at the stadium. The first month of the season will be against non-conference opponents who are all from Illinois. Three teams compete in the College Conference of Ilinois and Wisconsin (CCIW). An interesting twist will be the MIAA/NAC Challenge Series pitting all members of the Michigan Intercollegiate Athletic Association and the Northern Athletics Conference (NAC) on a single day (September 15). The pairings are determined on the basis of the 2001 standings of each conference. Hope will play at Concordia-Chicago in the renewal of a series that occurred during the 1970s. Hope’s season-opening foe, North Park from Chicago, is a first-time opponent. The 2012 pre-season roster includes 33 returning letterwinners from the 2011 squad. The team’s co-captains will be seniors Mark Karam of Grosse Pointe Woods (Warren DeLaSalle HS), Brian Lynn of Holland (Holland HS), and Ben Van Ausdall of Hudsonville (Unity Christian HS). Lynn and Van Ausdall were also captains as juniors. Two returning players received All-MIAA honors in 2011. Junior linebacker Tim Klaus of Saugatuck (Saugatuck HS) was a first team honoree while junior tailback Shawn Jackson of Comstock Park (Comstock Park HS) received second team recognition. Klaus was part of a defense that was among the NCAA Division III leaders in several defensive categories -- #45 in scoring defense, #81 in rushing defense, #85 in the pass efficiency defense and #90 in total defense. Jackson rushed for over 100 yards in four games and averaged 5.3 yards per carry. Two returning players received MIAA Player of the Week honors in 2011. Junior placekicker Evan Finch of Ann Arbor (Pioneer HS) kicked the winning field goal in an overtime victory over Adrian. For the season he was 23-for-25 on extra point kicks, raising his career stats to 39-for-41. He was also was six-for eight on field goals. In addition to being honored by the MIAA, junior Santino DiCesare of Dorr (Wayland HS) was the NCAA Division III Player-of-the-Week in recognition of his school-record 100-yard return of an intercepted pass for a touchdown against Olivet. The Flying Dutchmen will return a veteran offensive backfield. Junior quarterback Michael Atwell of Geneseo, Ill. (Geneseo HS) started every game a year ago. He completed 129-of-252 passes (51.2%) for 1,628 yards and six touchdowns. Fullback Brian Lynn of Holland (Holland HS) is a two-year starter. A year ago he had just two negative yards in 44 rushes. He also caught 17 passes. Junior Shawn Jackson of Comstock Park (Comstock HS) rushed for 10 touchdowns. In two seasons he has rushed for 1,284 yards on 248 carries and scored 14 touchdowns.